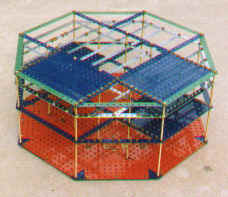 The Meccano model was built on an approximate scale of 1 to 5,400. This allowed the use of 15 hole or 7½" angle girders for the 60 foot width and height of the spoke sections. To construct the central hub, 8" screwed rods were used to represent the columns. The red flat plates on the bottom represent the floor. Half way up is the next floor. It is only partially plated in with dark blue perforated strips. Near the top are a series of narrow zinc strips. They represent what would be a steel catwalk in the factory. The edges of the roof are trimmed in green simply to match in with the other colors in the model. The 8" brass screwed rods, obsolete part number 79 were manufactured for me by Ashok Banerjee in India. On the right the Ship/Receive Inspection WIP spoke is the connection between the Hub and the main Test and Sort building. 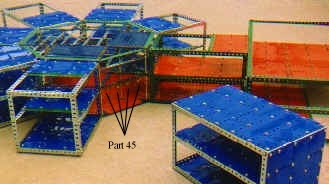 The Test and Sort Building was the only section not to have its floor fully plated in. The Implant spoke has been pulled back to allow a view into the hub. If you look hard you will see four Double Bent Strips, part 45 under the middle floor. These represent the "waffle" layer that is used in the construction plans. If you want to know more about the design of this plant and SLS Partners, click here for a paper written by Lindsay Leveen.